That low-ball estimate means seaside residents will witness a three feet inundation of sea rise in … 100 years? Try more like 30 years. And as usual, despite the in-your-face indisputable mathematics, politicians whose hands are freshly greased from the greenhouse gas belching Big Oil/Fracking and Big Coal industries go nut-up when terms like “global warming” are used. Such is the case of Louisiana Governor and Republican presidential contender Bobby Jindal, when he sent a letter to President Obama earlier in August just before Obama’s visit to New Orleans for the tenth anniversary of the Katrina disaster. In the letter, Jindal begged Obama to not use the term “climate change” in his public addresses, since that’s just a hoax, y’all know. 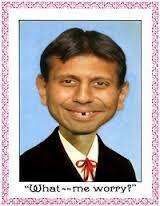 “There is a time and a place for politics, but this is not it,” Jindal wrote. Huh?? Who’s blathering politics? We’re talking science…. Melting glaciers, a shrinking Greenland, a massive fresh water dump into the seas that eventually could halt the ocean’s weather-policing warm water conveyor belt. Oh, that’s right. Science is a hoax too, according to the GOP lawgivers. Luckily, Obama ignored the “advice,” and gave an impressive speech about the urgent need to address global warming. 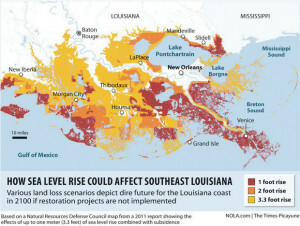 NASA, in its report, also mentioned that Louisiana’s “Master Plan” for reinforcing the state levee system, particularly in New Orleans, is woefully inadequate … especially for what’s to come. This entry was posted in Relatively Speaking by bonwitt. Bookmark the permalink.